Exquisite Pine Orchard home originally built in the late 1800s. Guests are welcomed into the first living room that features mahogany paneled walls and ceiling and a hand carved bar & detailed panel above the fireplace. The sun room has large windows that overlook the rear lawn & water views of LIS and detailed hand carved wood ceiling panels that were completed during the 80's when European wood workers lived at the home & worked in the wood shop on site. In 1927 the home was expanded to include a gorgeous two story 50 x 25 entertaining hall that is now used as a living room and can easily accommodate large gatherings. This room features wood paneled walls, large fireplace and the "little sister of Woolsey Hall", a 1927 Skinner organ with 1500 pipes and it's own pipe room in the basement. Also located on the first floor is a wood paneled library with pocket doors & fireplace, a 28 x 16 dining room with detailed moldings and French doors which open to the outside slate patio and gazebo, an eat-in kitchen, study and mudroom. The professional kitchen features a 6 burner Blue-Star range with Zephyr hood, Sub-Zero refrigerator and Miele dishwasher. A working 1931 elevator provides access to the 2nd floor which has 6-9 bedrooms and 6 1/2 baths. A possible in-law apartment can be reconfigured in the original servants area which is located off of a second staircase. The master bedroom retreat features a fireplace, large master bath overlooking the water with a sauna., Each window was reglazed in 2011, exterior painted in 2018. This home is located on 1.48 acres with deeded water views, pedestrian easement with access to a 40ft section of beach including a pier. 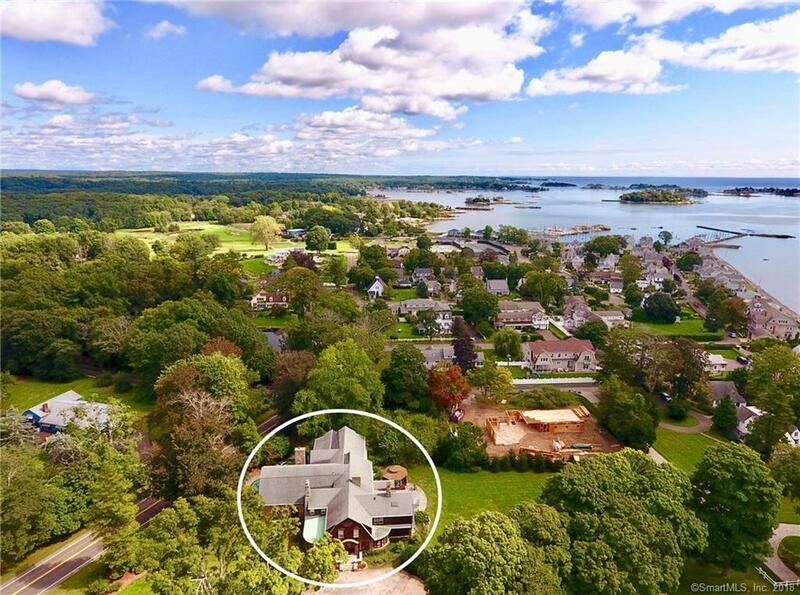 Conveniently located just a 7 minute walk to the Pine Orchard Yacht & Country Club, 9 minute drive to the Branford train station and only 85 miles to New York City. *Also available to purchaser with right to first refusal is a 10ft section of land from the road to the water including beachfront. **For insurance purposes, replacement value is $5.5M.